With a young three-year old and a one and half year old, I'm trying to find some more intentionality in our days. We have an amazing setup at home and there are so many opportunities for goodness, fun, learning, and life. Lately, we've been taking a morning walk almost daily. It's been great! I've been wanting to get back in shape in a way that does not include some random workout video that has any sort of plyometric (Hello back pain!) and I always try to get the boys outside when it's not insanely hot mixed with thousands of mosquitoes. The morning walks have been lovely. Even more lovely because we've been going with our neighbors (Biggest blessing ever!). Our walks have been fun, not only because we get to go with friends, but also because we get to explore. There is a pond that we visit and it has a beautiful black swan with oodles of ducks and turtles scattered throughout. Fun times these are friends. The boys love it and mama gets friend time and exercise! Win-win, for sure! On the days we don't go for our walk we will either go to the pool or to the park. And, as much fun as the park is, the toddlers usually head my way because apparently I'm pretty wonderful (In their eyes.). I tell them to go explore, play, run, climb, etc. etc. etc but sometimes they just need a little direction. Or, at least it seems that way now. So, I decided we would have a more intentional fun day at the park. I prepped my toddlers by telling them that today we were going to go explore and find treasures. Even though I got the what-is-she-talking-about faces, I went with it, made a treasure chest (Thank you, Kroger grocery bag and packaging tape!) 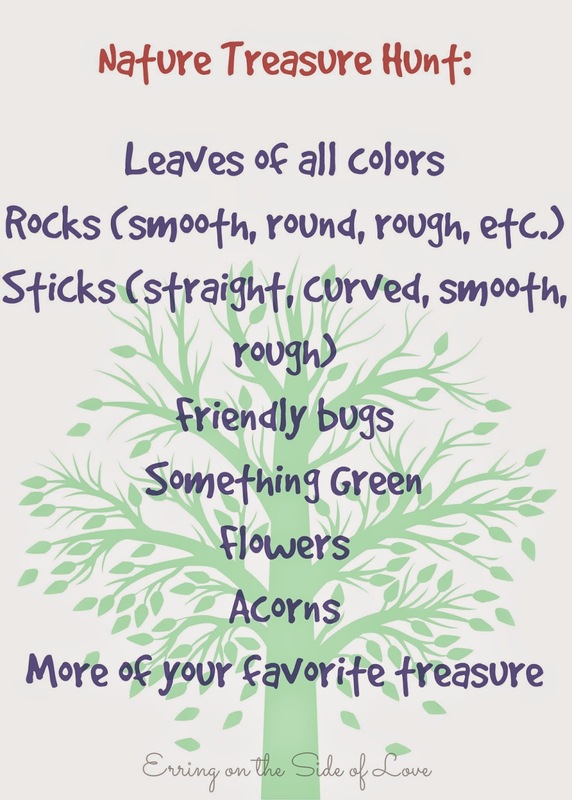 and we headed out with our sweet and simple nature treasure list. Bigfoot took to the Nature Treasure Hunt all of 10 minutes. He was over my 20-questions and just wanted to swing. But, once we found the cicada (locust) it was a game changer. Sticks galore, acorns, grass, flowers, and more were found. So. Many. Treasures! We were always on the hunt for more cicada leftovers but weren't very lucky. 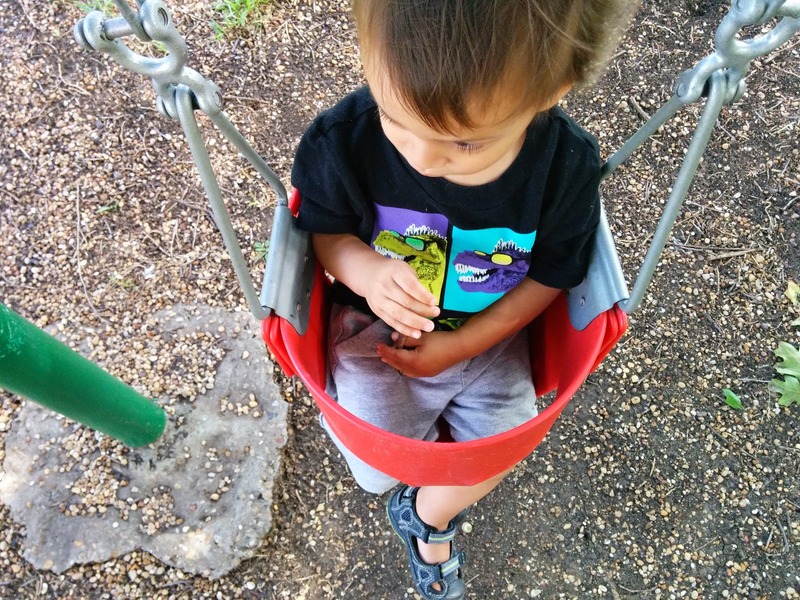 Linus was content to watch from his little swing perch holding his one stick perfect for his sweet hands. Eventually, though, he did want in on the fun and found various colored leaves and more sticks. Linus must not have been terribly impressed with our findings because the little guy ended up dumping everything out the moment he was alone with the treasure chest. Not cool, little man, not cool (I mama-rescued the situation before Bigfoot could notice his hard work had been tossed. Luckily, it was all in one place in the play house). Overall, I chalk this up as a nature success. 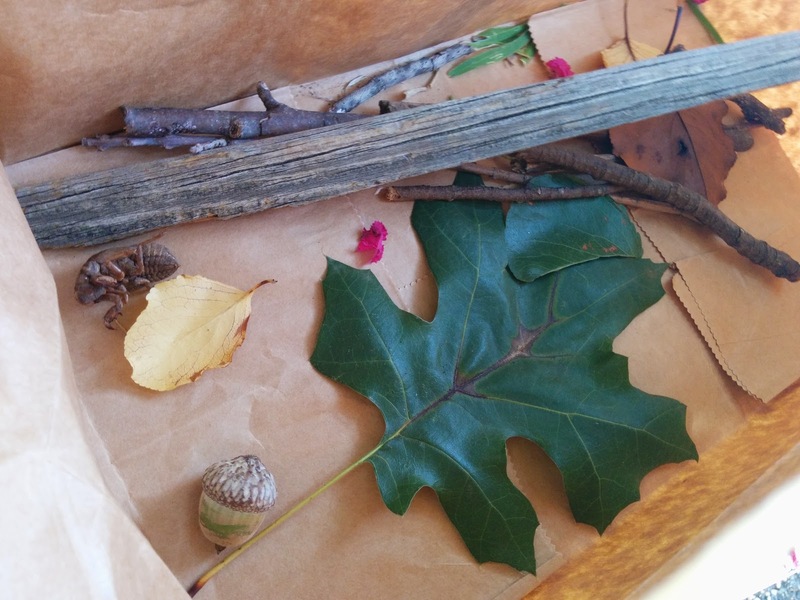 We talked about the cicadas, the acorns and who eats them, the beautiful leaves of different colors and how they change with seasons, talked about the properties of sticks, and more. The boys were sweaty, covered with dirt (somehow this just happens with boys no matter what they are doing outside), and accomplished. Good times were had and Bigfoot was so excited to share with Daddy all he found. 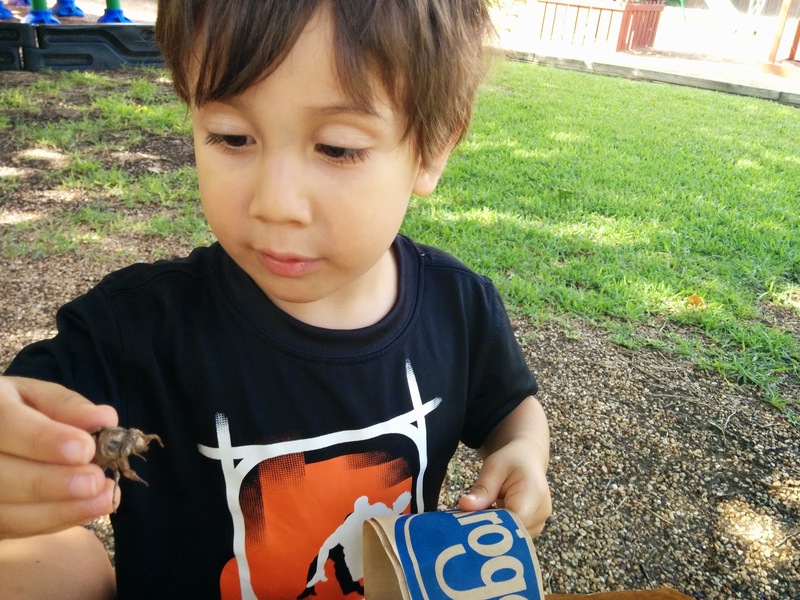 How do you engage your littles outside? What would you add to our little list? And I HEAR YA on dirty boys! I just started writing a post on my filthy children today. How does it happen so fast and so frequently?? Thank you, Theresa! It was a fun day. The boys have been enjoying treasure hunting ever since, which is also great! Regarding the dirtiness, I have no idea how they do it, but they do. It's a skill at this point.